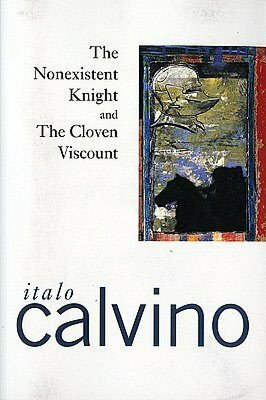 The Nonexistent Knight and the Cloven Viscount, Italo Calvino (trans. by Archibald Colquhoun), Mariner Books, 1977, ISBN 9780156659758, 264pp. I’ve long meant to give Calvino a try as his name is always mentioned in the company of other magic realists and fabulists that I like. I decided on this one simply because I found a nice copy used. Unfortunately, I didn’t like it very much and I wonder if I just got the wrong book to give Calvino a fair try. This is two novellas that showcase why he’s considered a magic realist, and they do meet at least my definition of that term. In “The Nonexistent Knight,” the titular character Agilulf is indeed an empty suit of armor which even Charlemagne finds off-putting rather than unusual. After setting up that the Knight is about the most perfect of the paladins (so much so that his fellow paladins dread him), a meal discussion reveals that the incident on which his knighthood is based might be false, thus leading him on a quest to discover the virgin whom he rescued many years ago. A couple of other characters–including a Red Sonja-type maid who yearns for the knight because he is perfect in every respect but physicality–and a strange nun narrator who keeps inserting her voice add some side-trips to this search, but it’s a strange fairy-tale that wraps up in the end but still leaves you wondering what it was all about. “The Cloven Viscount” is even stranger, about a lord who was severed in half (down the middle) and in which each half survives, yet one side is all bad and the other is all good. The fact that I can’t keep a bad Star Trek episode out of my mind the entire time I’m reading this is not a recommendation. More so than the first novella, I couldn’t see what the point was. With both of these, it could be that it was simply lost in translation, or that I just wasn’t open to the wonders of the stories. I’d be willing to give Calvino another try, although I think I may ask around for recommendations before picking up the next book.